No more loose vegetables dropping through the grate, or awkwardly trying to flip larger veggies. No more loose vegetables dropping through the grate into your coals, or awkwardly trying to flip larger veggies on a shish kebab skewer. 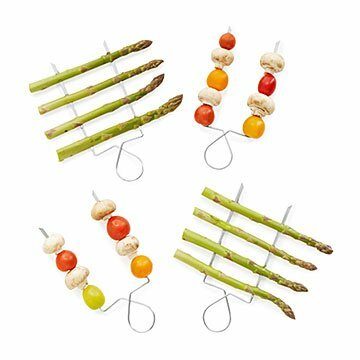 The double-spike design of these innovate skewers securely holds items ranging in size from potato cubes and pineapple chunks to grape tomatoes and mushrooms, and the handle helps you turn them with ease. Made in China. Raft skewers become hot. Use oven mitt or glove when handling. Love using these vegie skewers. Perfect for my vegetarian Dad! My dad loves to grill but has been complaining lately about skewers being awkward to cook long veggies like asparagus or long fruit pieces like pineapple. The design of the skewers solves that problem! My dad loved them!